So important that at any minute it could all just go up in flames. This is because I’m only ever “IN” during Mommy Office Hours and no normal desk job could survive these hours, only a pretend one. …and to check on things that have gone too quiet. Some days I don’t even show up for my desk job. This is a constant dilemma because I’m pretty ambitious. I love getting things done…writing for hours on end…clicking away at online training…exhaustively researching purchases and travel plans…micro-organizing my photo archives…and, my favorite, disappearing down Internet rabbit holes that leave me enlightened (and obnoxious). You know, things that take time. Well, not just time, un-interrupted time. And now that I have a 24/7 toddler (and a 15 hours/3 days a week 3-year-old niece), I’ve pretty much shelved all of that for the sheer rush that comes from removing a single desk job item from my to-do list before having to abandon everything for a non-desk emergency. (No wonder texting is the media of choice for my mom friends). These are the conquests that I squeeze into my tiny and sporadic Mommy Office Hours in my nice corner office (when the cubicle workers are not rattling at the gate for an open door policy). The way I USED to get things done. In addition to my micro-hours, I’ve also been mentally hi-jacked. It’s true. Things that used to take moments out of my day now take hours, if they get done at all. And my decision-maker has been short circuited so that I’m left paralyzed by the smallest forks in the road. I think it’s because of my “other” job. My beautiful life. Where’s there’s no chance to really unplug. reset. no boundaries. just one conglomerate merger of life and work. everything kept in-house. no outsourcing. and 100 percent cuteness to distract my best intentions. And my desk job never fails to make me look incompetent. I set up speakerphone conferences with my husband to complain about not getting my work done because “someone” ransacked my office, threw sheaves of paper out into the hall, ate office supplies, emptied desk drawers, and pulled hair…and that “someone” doesn’t even begin to look shamed. She just says, “Dah DAH!” and gets off with a gentle warning. But I still try to make up for my miniscule Mommy Office Hours on any given day by keeping extended Mommy Office Hours the next day which provokes all types of not-so-subtle resentment at the appearance of overtime…because toddlers are very short-sighted and will MAKE YOU PAY (no matter that you were Wonder Mom the day before). This is why I eat into my Mommy Office Hours by posting photos and one-liners about my child for the instant gratification of getting “likes” on Facebook (from other moms who feel sympathetic toward me because they know exactly what’s going on). I know that at a real job this would be considered “slacking off on the job” and “violating the company Internet policy”, but this is still a real job and it is permissible. Since I write the rules. You moms (you know who you are) understand. You do, right? Then, when that’s done, I sabotage my desk duties further by lingering at the social media water cooler until the next excuse to clock “OUT“. These excuses are varied and plenty. You know, fellow building tenants start complaining that there’s “something stinky”, co-workers reminding me that lunch was ordered more than an hour ago and isn’t here yet, a cat fight in the typing pool (er…uhm…ball pit) that has lead to someone’s emotional collapse. And then there’s dozens of negotiations that I weigh in on without leaving my desk (If you hit her with that I’ll take it away!). 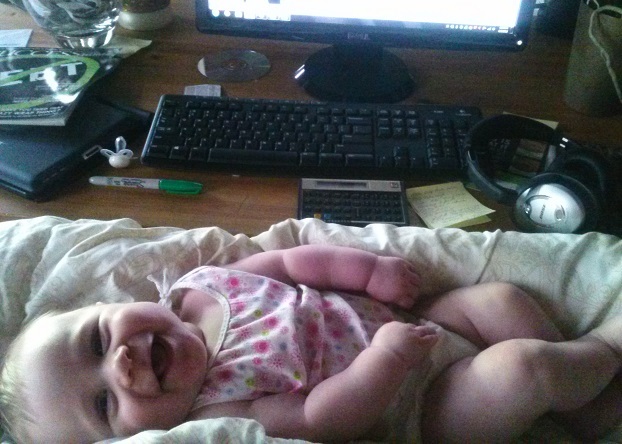 This slightly extends my micro Mommy Office Hours, usually by a full 12 – 15 seconds a pop. But there are additional special hours that I’m able to keep. Thankfully. Just look for a post of a sleeping baby on my Facebook page. And you’ll know I’m gearing up. So to keep me on my toes, if you see me in the break room commenting on anything and everything on Facebook, please remind me that I’ probably burning up my hours. Or send over a fire extinguisher…for my desk.